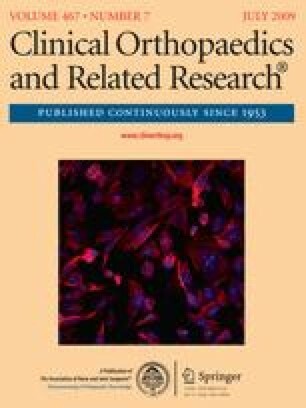 Cementless two-stage revision of infected total hip prostheses lacks the possibility of local antibiotic protection of the implant at the time of reimplantation, which leads to the concern that this protocol may not sufficiently eradicate periprosthetic infection. Moreover, early implant loosening as much as 18% and stem subsidence as much as 30% have been reported. To determine whether a cementless revision could eradicate infection and achieve sufficient implant stability, we prospectively followed 36 patients with two-stage revisions for septic hip prostheses. We used a uniform protocol of a 6-week spacer interval, specific local and systemic antibiotic therapies, and cementless modular revision stems. The minimum followup was 24 months (mean, 35 months; range, 24–60 months). In one patient, the spacer was changed when the C-reactive protein value failed to normalize after 6 weeks, and the reimplantation was performed after an additional 6 weeks. No infections recurred. There was no implant loosening and a 94% bone-ingrowth fixation of stems. Subsidence occurred in two patients. The Harris hip score increased from a preoperative mean of 41 to 90 at 12 months after reimplantation and later. Using cementless prostheses in two-stage revisions of periprosthetic infections of the hip in combination with a specific local and systemic antibiotic therapy seems to eradicate infection and provide implant stability. Each author certifies that his or her institution has approved the human protocol for this investigation, that all investigations were conducted in conformity with ethical principles of research, and that informed consent was obtained.